Use the Task Information dialog box to view basic information about the selected task. 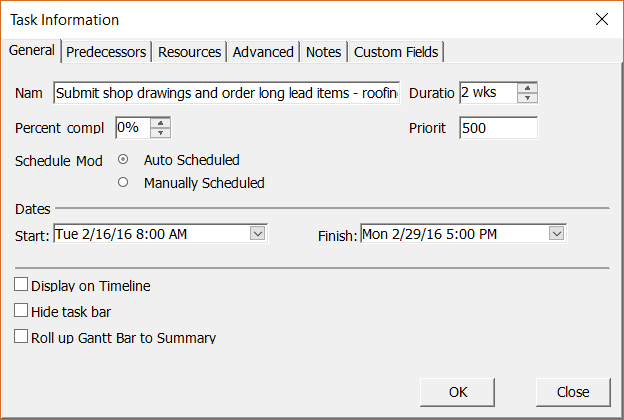 View task durations and indicate whether the durations are estimated or set. View progress on a task. 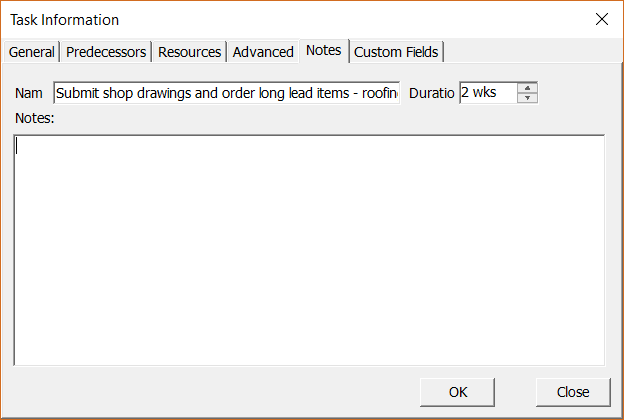 Enter task durations and indicate whether the durations are estimated or set. Track progress on a task by entering the percentage of completion. Enter the task start or finish date to set a Start No Earlier Than or Finish No Earlier Than constraint. Name Shows the name of the selected task. You can enter another task name in the Name box to change it (edit options are available just in planner application). Duration Specifies the amount of time needed to complete the selected task. You can enter duration in minutes, hours, days, weeks, or months (edit options are available just in planner application). Percent complete Specifies how much of the task has been completed. Enter a number between 0 and 100 that indicates the percentage of actual progress on the task. Based on this value, application then calculates the task's actual and remaining duration. If you enter a percentage for summary tasks, the progress is distributed to its subtasks (edit options available just in planner application). Priority Indicates how available a task is for delay during resource leveling. Schedule Mode Indicates whether a task is scheduled manually or automatically. You can sort tasks by priority by using the Sort command on the Project menu. You can also use priority to filter tasks. Start Specifies the task's scheduled start date. If the task has a predecessor, Project calculates the start date. If you enter a start date for a task, Project sets a moderately flexible constraint, such as Start No Earlier Than (SNET), on the task (edit options available just in planner application). Finish Specifies the task's scheduled finish date. If you specify a start date and duration, Project calculates the finish date. If you enter a finish date for a task, application sets a moderately flexible constraint, such as Finish No Earlier Than (FNET) on the task (edit options available just in planner application). If you specify both a start date and finish date, the task duration will be calculated. It also sets a moderately flexible constraint, such as Finish No Earlier Than (FNET). The type of constraint that's applied depends on whether the start date or finish date is entered last (edit options available just in planner application). Display on timeline Will mark the task to be shown in the Timeline view. Hide task bar Hides the task bar for the selected tasks when viewing the Gantt Chart or Calendar views. To display hidden task bars for the selected tasks, clear this check box. In the Gantt Chart view, if the task is rolled up, both the task bar and the rollup symbol on the summary bar are hidden. If the task is a summary task and subtasks are rolled up on it, only the summary bar is hidden. By default, this check box is cleared. Roll up Gantt bar to summary Specifies whether you want the subtasks you selected rolled up to the summary task bar so that the bar displays symbols that represent subtask dates. If you select a summary task, this check box is called Show rolled up Gantt bars. Clear this check box to hide the symbols for rolled up tasks on the summary task bar. By default, this check box is cleared. Notes Offers the posibility to the user to note something in the note field of the task, this field can be added as a column in any task view. We are incredibly excited to have you here. You've been added to our list and you will hear from us soon.